When Sony released its first full-frame DSLR, the Sony Alpha 900, back in 2008, it was the highest-resolution DSLR to date and held its own when compared with competitors such as the Nikon D700 and Canon EOS 5D Mark II from the more established DSLR vendors. 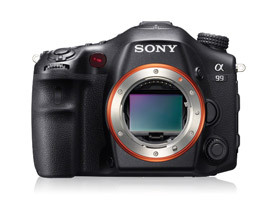 In 2009, Sony followed up with a lower-end full-frame model (the Sony Alpha 850) but since then has been focusing its efforts on cameras with smaller sensors, including its popular NEX line of compact interchangeable-lens hybrid cameras as well as its SLT line of cameras that utilize a stationary semi-transparent mirror rather than the flip-up mirrors in conventional SLRs. Because there’s no need for the mirror to move up and down between shots as there is with a traditional SLR, the Alpha 99 and other SLT cameras can display live-view images constantly and autofocus works quickly and continuously while images are shot rather than needing to focus between frames. The Alpha 99 is the first Sony camera to use its new full-frame 24.3-megapixel Exmor CMOS sensor (also used in the upcoming full-frame compact Sony Cyber-shot DSC-RX1) and incorporates a new separate multi-segment optional low-pass filter to increase ability to resolve detail. The new sensor delivers a much broader sensitivity range (from ISO 100 to 25600) and utilizes a new area-specific noise-reduction algorithm in an attempt to improve low-light performance limited by the nature of the SLT technology, which diverts some of the light hitting the semi-transparent mirror to the phase-detection AF sensor. Indeed, the SLT Alpha 99 achieves very high scores in good lighting conditions, but does less well in low-light conditions, though still not bad considering the SLT disadvantage. Its overall score of 89 not only puts it at the top of the heap among Sony sensors by far, but also brings it in with the fifth highest DxOMark Overall Score among cameras we’ve tested thus far. This is in no small part due to the A99’s impressive dynamic range, which now the 5th position for Landscape Score at 14 Evs. The A99’s Portrait Score is also very high at 25 bits, placing it in the eighth spot for color-depth performance. The Alpha 99’s closest competitor in terms of price point is probably the Nikon D800 (which at $2,999 is about $200 over the A99’s price of $2,800), but it sports a higher resolution Sony-made 36.3-megapixel CMOS sensor. The lower-priced Nikon D600 ($2,100) is actually based on a very similar 24.3-megapixel Sony sensor—though not completely identical to that in the A99 (according to Nikon), it’s likely the same technology. In fact, in good lighting conditions scores are very close among the three cameras, with the A99 less competitive in low-light conditions due to the SLT technology as mentioned above. And while the Portrait Scores indicate that color-depth performance is very similar across all three cameras, the limitations of the SLT are clearly shown in the A99’s poorer Sports Score at 1555 ISO (vs. 2980 ISO for the D600 and 2853 ISO for the higher-resolution D800). Even more impressive is the Sony Alpha 99’s performance compared with the significantly higher-priced Canon EOS 5D Mark III ($3,500) and Canon EOS 1D X ($6,800). Though it can’t compete with the more-expensive models for low-light sports photography—no surprise, since besides the SLT limitation, the Sony also delivers the highest pixel count vs. the 18.1-megapixel 1D X and the 22.3-megapixel 5D Mark III—its Overall Score of 89 handily beats out the 5D Mark III’s score of 81 and 1D X’s 82. Again, it’s the dynamic range Landscape Score that gives the A99 its biggest boost. Though the A99’s ISO latitude is more restricted (topping out at ISO 25600 vs. 102400 for the 5D Mark III and 204800 for the 1D X), its lowest setting of ISO 50 again helped it achieve the best dynamic range score by far. The use of Sony’s SLT technology in its top-of-the-line full-frame shooter delivers both pros and cons. The obvious downside is low-light performance compared to its closest competitors, though Sony has done much to mitigate the SLT’s effect with new, targeted noise-reduction algorithms. The SLT also means the Alpha 99 uses an EVF, but again, Sony’s 2.4-million-dot OLED beauty offers 100 percent coverage, and compares well with the optical viewfinders of its competitors. The upside to the technology, of course is fast performance with full-time live view and continuous autofocus, which makes the A99 one of the best choices among semi-pro cameras for shooting video.